Sky looked at the bright side of Bradley Wiggins’ abandon today when the Giro d’Italia rolled on without him. It opens the door for the other eight riders, said sports director Dan Hunt, especially Rigoberto Uran in third overall. “We’ve had our ups and downs, and our problems, but if you don’t want problems, don’t come to the Giro,” Hunt told Cycling Weekly. He spoke while sitting in Sky’s black Jaguar team car this morning. The sun cut through the rain clouds, giving hope for the next week and half of racing. “It’s not a situation that anyone wanted, but at the end of the day, we still have guys up on GC,” he continued. Vincenzo Nibali (Astana) leads the overall classification by 41 seconds over Cadel Evans (BMC Racing). Uran sits in third at 2-04 minutes. Three others – Robert Gesink (Blanco), Michele Scarponi (Lampre-Merida) and Mauro Santambrogio (Vini Fantini-Selle Italia) – are also two minutes back from Nibali. Today’s stage to Cherasco, the longest of the race at 254 kilometres, offers calm before the storm. This weekend, weather permitting, the Giro climbs to Bardonecchia and Galibier. Uran won the first summit finish stage to Montasio. Last year, claimed the best young rider’s white jersey while placing seventh overall. Wiggins lost ground on yesterday’s rain-soaked stage to Treviso and finished 3-17 minutes back. 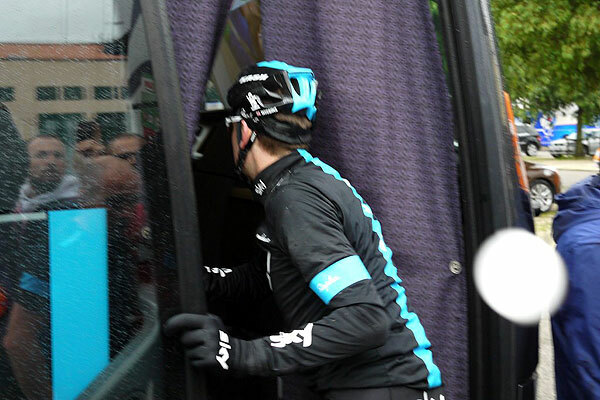 He climbed immediately on the bus and effectively closed the door on his Giro d’Italia. Last winter, he targeted the Italian Grand Tour. With Chris Froome given the right to lead the Tour de France team, little is known of Wiggins’ next move. Pulling out of the Giro d’Italia early, said Hunt, gives Wiggins options.